Ken Dodd was a comedian and actor from Liverpool best known for his wacky image and “tickling stick”. Even while in his eighties the comedy veteran was still playing 150 gigs a year, although that was around half the number he performed at the height of his 55-year career it shows his dedication and appeal to fans. With his wild hair, buck teeth and famous feather dusters, or “tickle sticks”, Dodd was the self-styled King of the Diddy Men. With his signature tune, Happiness, his traditional music-hall style act may have seemed dated to more modern audiences towards the end of his career, but he still had legions of admirers. His incredible career spanned from 1954 to 2018! Did you hear about the shrimp that went to a prawn’s cocktail party? He pulled a mussel. How many men does it take to change a toilet roll? Nobody knows – it’s never been done. Honolulu, it’s got everything. Sand for the children, sun for the wife, sharks for the wife’s mother. What do you do sir? (to a man in the audience.) I’m a consultant in steel and iron. Ah so you steal and your wife irons! I’ve done some brave things in my time. I played Nottingham Labour Club. I was the one who shouted ‘Three cheers for Mrs Thatcher’. And it was during the bingo. Do great comedians come in cycles? Yes, some do, but others prefer to walk to work. I wouldn’t part with my teeth. I’m the only patient who can sit in the dentist’s waiting room and have his teeth checked at the surgery. Ken Dodd’s marathon sets are known for their extraordinary length, quick-fire one-liners and constant innuendo and jibes aimed at a hate figures ranging from tax collectors to local councillors and traffic wardens. Sir Dodd has also had a number of hit records over the years, and one of the longest ever residencies at the London Palladium. His book ‘Look At It My Way’ was published in October 2009. 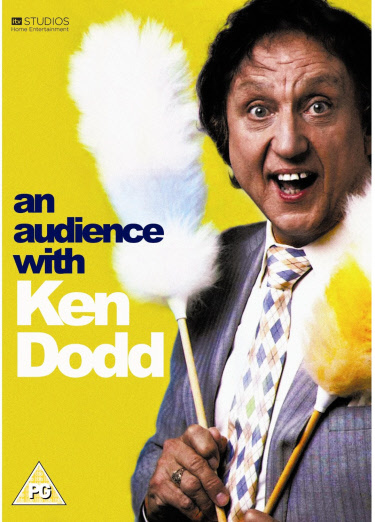 His DVD ‘An Audience with Ken Dodd’ was released in May 2010 and is available to buy in all DVD shops and some rubbish ones. In 2017 Ken was given a knighthood. Rest in peace Sir Ken! Feature image used under Creative Commons 2.0, thanks to University Of Liverpool Medical School for making it available. Here is the image source. Wolverhampton civic. Those that left early missed Dickie Mint and Kens impressions of famous American films with Geordie ,Black Country and Scouse accents. well done ! Live is a MUST ! A lovely funny man, I have followed him for many years. He also has a strong faith and worships egularly at Liverpool Cathedral. God bless him and Sibby. Just seen Doddy at Bournemouth,laugh,laugh,laugh,my jaw still aches. His age means nothing to him but entertaining means everything. Wonderful man, long may he reign! Whatt about a nkighthod,Your Majesty? How lucky we are to have such a treasure and long may he remain with us. seen mr dodd seven times end up with sore sides and a great tickelsome night v v v good….